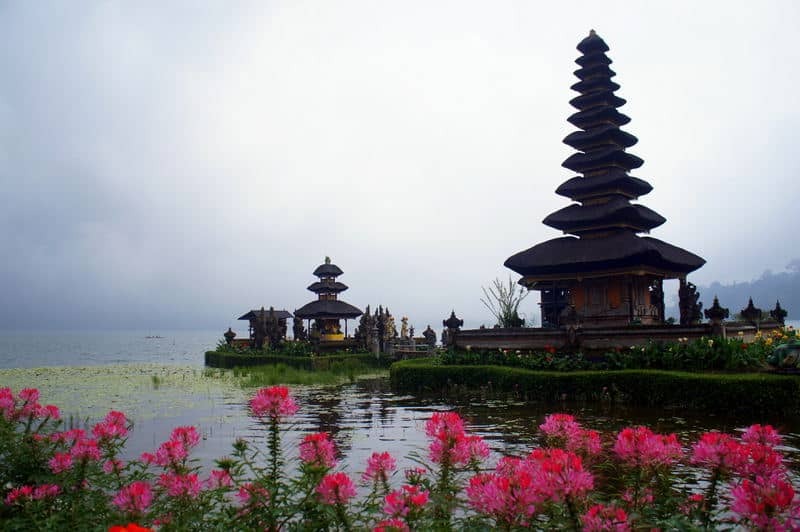 Once you make it to Bali, you will understand why this island is commonly known as the “Island of a Thousand Temples”. Some locals estimate there are over 20,000 different and unique temples around, which make it an unbelievable place to explore. For this reason, no visit to Bali would be complete without a trip to see at least one of Bali’s temples. Tanah Lot is one of the most picturesque spots in Bali and the best place to watch the sunset. It is placed at a very scenic location- on a rock just offshore. It is said to be the work of revered 15th century Hindu priest Nirartha and forms an important element of Balinese spiritualism and mythology. There are lots of stalls here where you can buy souvenirs, and the sellers are not pushy and they are a fair price. If you enjoy photography, you mustn’t miss the view. Even with all the tourists, it’s a serene, beautiful place to visit. Entrance fee: 30000 rupiah ($2.63), free after 6 pm. After Tanah Lot, this is perhaps the most photographed temple on the island and is certainly one of the iconic images of Bali. It was built on the lake, nice scenery and unique. Locals will pray from the temple on shore and go all the way out to the temple on the lake by crossing two bridges. Make sure to visit it in the morning, when the view is clear and the air is so fresh. Allow yourself a good hour in this temple and enjoy it by walking alongside the beautiful lake. Contemplate the scenery. It’s one of the most beautiful serene places in Bali. Ulun Danu temple is surrounded by a small area with plenty of local restaurants where you can try some traditional Balinese dishes on the cheap. You should not miss digging into a plate of Nasi Campur Ayam (steam rice, Balinese shredded chicken, some vegetables, minced fish satay, peanuts, chicken skin, and a slice of boiled egg) and Sop Buntut (Oxtail Soup). Entrance fee: 30,000 rupiah ($2.63). 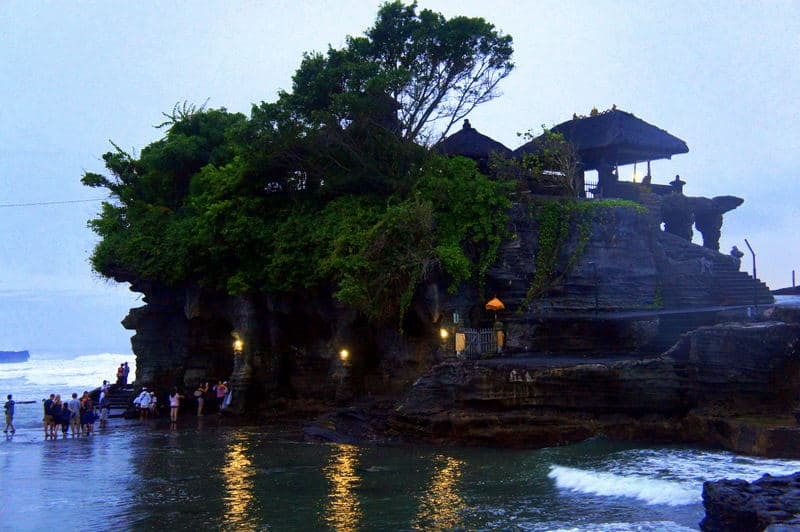 This is the most spectacular temple on the island of Bali. The inner sanctum of the temple is perched majestically on the edge of a steep cliff that towers above the legendary surf breaks of southern Bali. 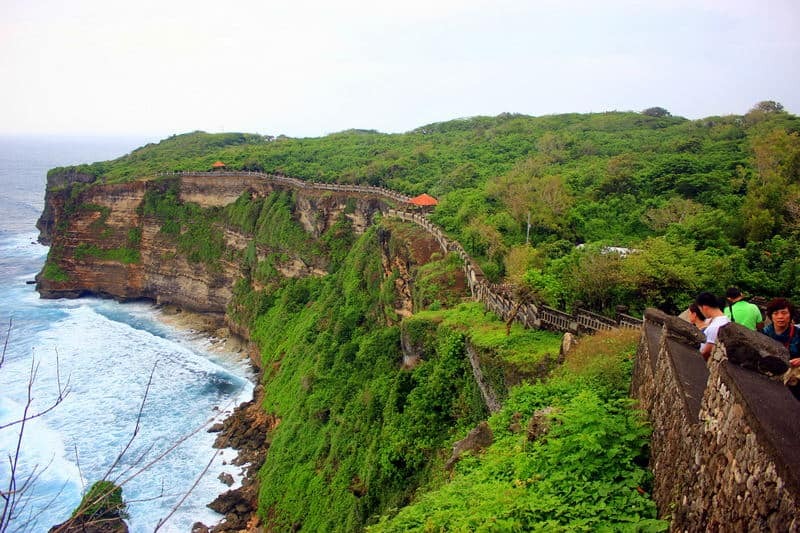 If you are around Bali don’t miss the chance to visit Uluwatu: the ocean, the cliff, the Kecak dance the sunset – a magnificent way to spend a couple of hours in Bali. Entrance fee: 20,000 rupiah ($1.35). Which one these 3 temples would you like you visit when in Bali? Agness and Cez call themselves “tramps” as they keep exploring the World on the cheap without permanent home since 2011. On their blog called eTramping, they share some tips on how to travel the world with $25 in their pocket. They are currently based in China where they dig into baozi and jiaozi, explore local temples and teach English to kindergarten students. If you would like to read more about their adventures, you can check out their “Add the Brick to the Great Wall: Experience-based Advice for China from Expats” e-book or visit eTramping. Ulun Danu is definitely my favourite one. It looks stunning in the morning and late at night :). I’m super jealous! I need to go to Bali ASAP. Thanks for the post Agness! Beautiful pictures, these temples look really beautiful! Amazing pictures. I particularly loved the last one. It looks very different from the usual temples of Bali! Me too 🙂 I would love to check it out myself one day. I only made it to Tanah Lot the first time…ooops! Time to go back, I guess…darn! They’re all so gorgeous too! They’re definitely gorgeous. I can’t wait to visit one day! I didn’t like the Ulun Danu temple that much.. it was pretty, but the other two where totally amazing. Fantastic post! I’m going to Bali in May and this really helped me drill down and what I’ll be able to see in just a week.